One of the most respected sound healers in the world today Neither the voice nor the man can be explained in one paragraph or in any combination of words. He is essence of, manifestation of, emanation of . . . and his vitality, his magic and his integrity cannot be articulated in electronic swipes of ink on a papyrus of light particles captured on a computer screen. So we invite you to feel his work through what you sense reading these words and listening to the sound bites, which can no more adequately capture his voice than words can portray the man. Tom's life studies and many lifetimes of remembrances, complete with background knowledge and experience allow him to move with equal facility between Tibetan Buddhism, Egyptian High Alchemy, Taoism and Hinduism and the sciences relative to each. A workshop or teaching experience with him leaves you empowered with a vast body of knowledge suffused with tones that awaken all the physical centers, thus allowing for greater understanding of the words and Spirit imparted. Tom teaches in Intensive formats throughout the world. Because of his immense field of personal knowledge ? from the sciences to spirituality ? 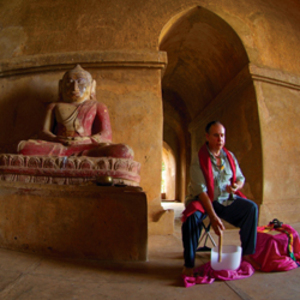 each Intensive is imbued with knowledge relative to the subject matter and overlaid with the sacred sounds he creates. In other words, if you don't fully get the transmission from the words, you can't escape the truth of it when the sounds are projected from his voice toward you. Each Intensive has a particular Intention or theme. Some come from Tibetan energy practices, some evolve out of Tom weaving many modalities into a more Western approach to esoterica. No two Intensives are ever the same as they combine information drawn out by the consciousness of the group and tones, specific mantras and tone meditations, brought through specifically for the group present. If you are drawn to be present, that is because your consciousness in the room affects the presentation and your body can literally feel the potential benefit.
? 2008 Tom Kenyon. All rights reserved.